The Chicago Blackhawks have agreed to terms on a one-year, $800,000 contract with unrestricted free agent Patrick Sharp. The deal also comes with a potential $200,000 in bonuses that he can earn. The move was reported ahead of the start of free agency starting at 12:00 PM EST and was confirmed by Mark Lazerus of the Chicago Sun-Times. Sharp is returning to the Blackhawks after spending two years away from the team. The 35-year-old spent parts of 10 season with the Blackhawks after being acquired from the Philadelphia Flyers in the 2005-06 season. A successful tenure with the Blackhawks saw Sharp score over 25 goals in each full season from 2007-08 until 2013-13 with 20 goals in 2006-07 and over 30 goals in four separate seasons. The veteran Sharp is also a three-time Stanley Cup Champion with the Blackhawks, winning the titles in 2010, 2013 and 2015. In 869 career NHL games split between the Philadelphia Flyers, Chicago Blackhawks and Dallas Stars, Sharp has scored 277 goals and 599 points. He’s also scored 47 goals and 87 points in 142 playoff games, qualifying for the postseason in eight consecutive seasons, seven with the Blackhawks and one in his first season in Dallas. Sharp returning to the Blackhawks is far from the first player that the Blackhawks are bringing back after parting ways with them via either trade or free agency. Some names that the Blackhawks have done this with in the recent past include Kris Versteeg, Andrew Ladd, Brian Campbell, Johnny Oduya, Jeremy Morin and earlier in the offseason, the Blackhawks swung a trade that sent Artemi Panarin to the Columbus Blue Jackets with former (and now current) Blackhawks Brandon Saad returning to Chicago as a result. Sharp was a beloved player in his time in Chicago, but unfortunately, no player is safe from the salary cap-induced moves that the Blackhawks have made over the years. Due to cap issues, the Blackhawks were forced to part ways with the veteran Sharp who was set to earn $5.9 million per season for another two years – a number the Blackhawks simply couldn’t fit into their plans as they looked to remain competitive. In his first season with the Stars in 2015-16, Sharp saw a resurgence. After scoring 16 goals and 43 points in 68 games in his final season with the Blackhawks, he bounced back to score 20 goals and 55 points in 76 games. 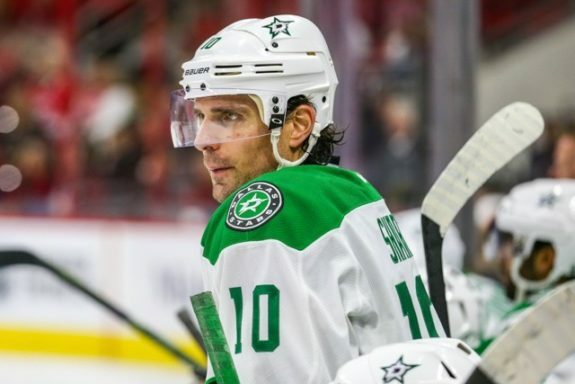 Following that season, however, Sharp saw a decline in play as he battled through injuries, scoring just eight goals and 18 points in 48 games in his final year under contract in Dallas. Now set to join the Blackhawks again, Sharp has a chance to bounce back once again. This time around in Chicago, Sharp might not be expected to contribute in quite the same way that he did in his first tenure with the team. While he can still be used in a top-six role when needed, he might be best suited to play on the team’s third line to provide some valuable depth scoring for the team as they look to bounce back from two consecutive first-round playoff exits.